They tried to bury us. 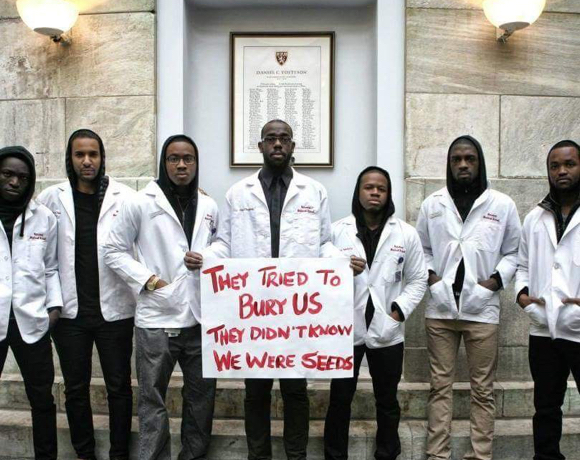 They didn’t know we were seeds." We look at those young men and wonder who they were talking to. Police, no doubt. And errant neighborhood watch vigilantes, of course. But more likely, and more frequently, they probably had White teachers to whom it applied. 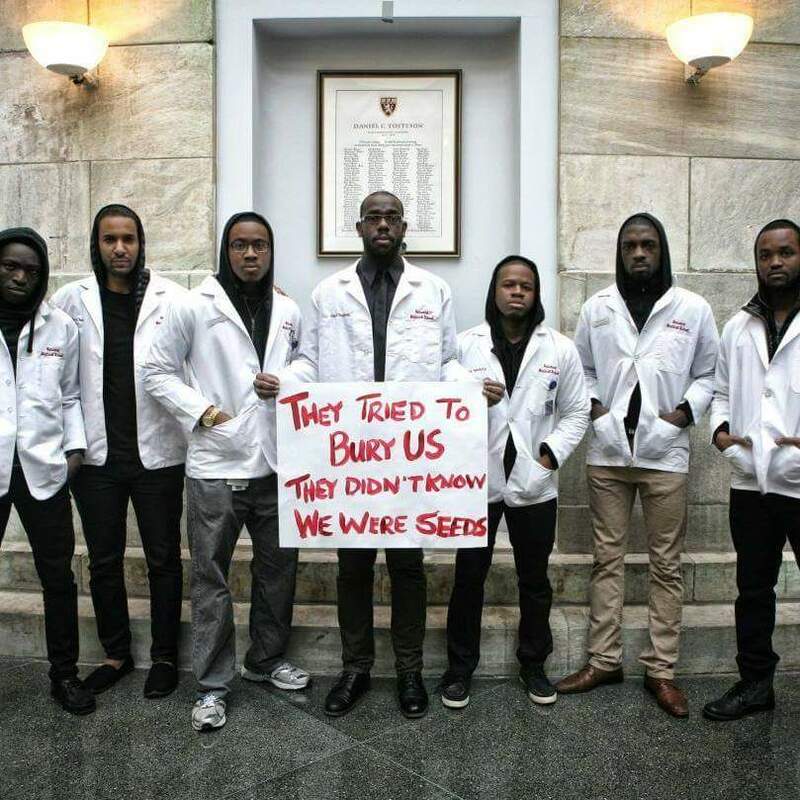 How many Black boys have educators looked at, and not assumed, “You could go to Harvard medical school one day”? Or, “You could be a doctor someday”? To what extent does their bell toll for us? 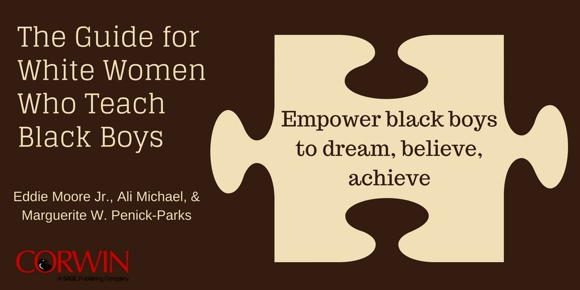 The title of our new book, The Guide for White Women Who Teach Black Boys gets a fair number of double takes. Inevitably it evokes a laugh and a comment along the lines of, “Wow, I bet a lot of people really need this book.” Ali Michael often states she felt the same way when asked by Dr. Eddie Moore, Jr. to co-edit the book. Ali remembers thinking, “I want to read that book! I want that book to exist!” It was an easy project to say yes to. Teaching Black boys is a task that, according to recent statistics, the educational system is not accomplishing with consistent success; in fact, the Black boys who are flourishing in our schools are often doing so because they had support outside of school. In other words, it wasn’t something we as educators were doing that guaranteed their success. Too often, those who succeed are doing so in spite of us. The stories of successful Black men — while including White women teachers who see them clearly and support them — inevitably include many more stories of misunderstandings, low expectations, and a helplessness (on the part of White women) in the face of larger, societal tropes about race. These are sand traps, potholes, temporary pitfalls that Black boys land in. White women can’t see or don’t know that it’s temporary, that with their help, the child could leap out and keep moving forward. But teachers can’t offer help if they don’t realize the nature of the problem. They see the trope and think it’s permanent, essential. They're stuck in it, too. I know these sandtraps well. I grew up in an almost all-White community where we never talked about race because we thought it was more dignified to be colorblind. Our failure to talk about race meant we failed to recognize and talk about racism. And so when racist messaging snuck into our homes at night and convinced us that White people were safe and Black people were dangerous, we had no tools for combating it. We bought it. And those messages lived on in our unconscious minds when we grew up and became teachers. I remember a long-term substitute job that I held in my early 20s in a predominantly Black school in Pittsburgh, where I spent an entire period correcting students’ African American vernacular English. Through my relationships, I was overcoming many of the falsehoods I'd learned about Black people... but my anti-Blackness was deep in ways I'd never even thought to question. The White women teachers who are effective teachers of Black boys know the tropes, the potholes, the pitfalls, that threaten to consume Black boys. They also know the fears that Black children and their families hold about how success in school might be mutually exclusive with Black cultural and linguistic styles. They work to build schools where Black students can be successful without having to be someone besides themselves. But how? This book is about the big picture. It’s not a book of tricks decoding some kind of mythical and enigmatic Blackness or boyness. It’s about recognizing that we're all teaching within a giant jigsaw puzzle, and we need to be able to see the picture on the box to do it well. The children themselves are not the puzzle, nor are their families or communities. Each of us — teachers, administrators, policy makers, etc. — has a race and a gender just like our students. Each of us plays a role in racism. Each of us is part of this puzzle. The first and most critical part of teaching Black boys is understanding. And it’s not about understanding Black boys. It's about understanding self. We live in a country where Whiteness is rarely named, where we don't talk about the fact that 85% of the teachers are White (65% are White women). It's about understanding the research that says if you were socialized as a White person and a woman, when you're shown a video of preschoolers and asked to find the “problem behavior,” you're likely to keep your eye on the Black boy in the video almost twice as much as on the other children, even though the video contains no problem behavior (Finnerty, 2017). It's about understanding that if you grew up in the U.S., you likely grew up in a largely segregated community, in racially segregated social circles, reading books about White people, watching movies about White people, and receiving messages that reinforce anti-Blackness. It's about realizing that even though we're individuals, with individual-level intention and motivation, we're part of a system where we're asked to judge, evaluate, and gatekeep; and our bias is mutually reinforcing as we and our 85% White colleagues look out at our students from this White worldview (Frankenberg, 1992). When we first solicited chapters for this book from parents, students, teachers, and academics, most of the 41 chapters that came back implored teachers to start by understanding themselves. That’s how important this point is. We didn’t leave those chapters in that state, of course — that would've been an incredibly boring book. But we included seven chapters on understanding self and made note that no other piece matters quite as much. This is only the first of three blog posts, and in the others we'll share about respecting (Part 2) both the multiplicity and diversity of Black boys, as well as the racial context in which they're growing up and connecting (Part 3) school structures with student success. But as we close Part 1: Understanding Self, we invite you to engage in one of the two sample exercises shared from our book below. Examine why reducing the impact of bias in your interactions is “personal” to you. A personal motivation will help you maintain your commitment. Explore your implicit bias by taking one or more of the race-related Implicit Association Tests (IAT) via the Project Implicit online test site hosted by Harvard University. Surround yourself with counter-stereotypical images and put time and effort into strengthening relationships with people of different racial and ethnic backgrounds from you. Create a group at your school to engage in reflective practice about how bias impacts your teaching and relationships. Educate yourself and colleagues on the ways that implicit bias impacts hiring practices, admissions practices, and the experiences of faculty of color. Practice self-care! Research has shown that bias emerges more readily when people are run down or otherwise cognitively burdened. Frankenberg, R. (1992). White Women, Race Matters: The Social Construction of Whiteness. Minneapolis: University of Minnesota Press. How do you examine implicit bias and unpack Whiteness in your classroom and in the world at large? Did you try one of our activities? We'd love to hear about it. Share your experiences in the comments below. Tchers’ Voice is filled with great ideas from passionate educators just like you. Let's get better together!